This is a really awesome little living space. It's a great use of space. 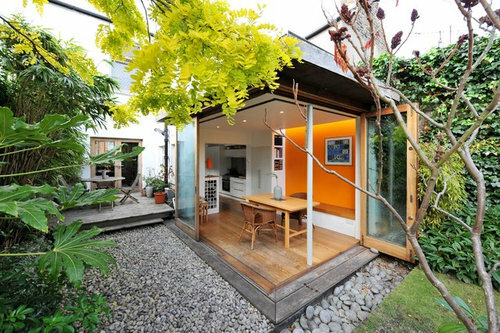 I love the folding door and how it opens it up. Also, is that area above the kitchen a sleeping space? There is a small space above the high level kitchen units - this is just a shelf for storage of less frequently used kitchen equipment. Wow! Thanks for such a quick response! And wow, again, it looks much larger than that! I really love your use of space, so beautiful and functional! How much of the length is kitchen? Is it half? The kitchen dimensions are 3m long x 2.5m wide. It is a galley kitchen with units along both walls. 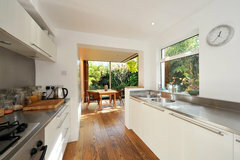 The circulation space between the counter tops is 1.3m wide. Thank you! I so appreciate you response. I misunderstood.